Controversial as it might sound, I had always thought of Center Parcs as some sort of cult: friends who had visited, colleagues who had worked there, talked long and longingly about their experiences, and I had developed an image of a set of places that were built for pleasure (albeit mainly of the recreational kind), each contained under an Eden-style, domed roof, where one could cycle or play tennis regardless of the weather. That was all I knew. Even the name ‘Center Parcs’ (which, apparently, is incorrectly spelt in every language) made these places seem foreign, otherworldly, closed to the uninitiated. Last weekend, however, I made my first visit to Center Parcs, and as well as enjoying an unusually active few days – albeit not, as it turns out, totally sheltered from the elements – the experience made me reflect on the organisation’s particular service style, culture and the guest experience. 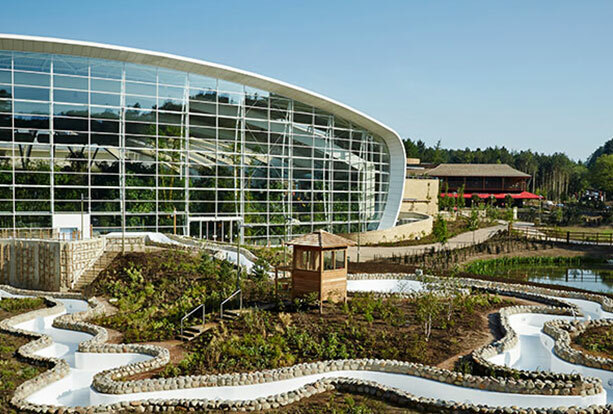 This is not a review, merely a set of musings; however, I was and remain intrigued by Center Parcs – where the concept came from, what makes the business model tick, and why so many people love it so much. Making full use of the free Wi-Fi (way to go Center Parcs! ), I did some historical research: I discovered that Center Parcs was founded by a Dutch entrepreneur, Piet Derksen, who in 1968 purchased woodland near Reuver so that the staff and customers of his chain of sporting goods stores could get out of the cities and relax, initially in tents, then later in wooden bungalows. A devout Catholic, Derksen expanded the concept, with each park incorporating a small church: poignantly, according to Wikipedia, the one at Elveden Forest is now a Starbucks. Information about Derksen is hard to find, and as far as I could see, he is not mentioned at all on the Center Parcs website. Trying to imagine what he was like – successful in business, enthusiastic about sports and outdoor living, religious, philanthropic – I wondered how much of his original vision endures in the sprawling estate and diverse ownership that is the modern Center Parcs. Bluntly, why is his name not mentioned anywhere – notwithstanding the fact that he died in 1996? Is the much-loved Center Parcs Pancake House, inspired by the centuries-old, Pannenkoeken Huis for which (apparently) Holland is famous, a testament or tribute to Derken’s influence? I also surmised that the atmosphere of the place – like some upmarket campsite, set among endless trees and populated by families and couples, earnestly cycling, walking, playing sport, swimming, spa-relaxing, eating and drinking modestly before retiring to their lodges – must still reflect some of Derken’s original, ascetic vision. Yet, I would be the first to admit that quite a lot of this is speculation. If I were to say (in no way disparagingly) that Center Parcs struck me as being like Disneyland without the ‘pixie dust’, I should also have to say that it feels somewhat like Disney would if Walt had been expunged from its corporate history. ago, and perhaps if that had happened, there would have followed an inevitable dilution of Walt’s way of doing things. Indeed, it is part of Disney’s corporate folklore that there was a substantial wobble when Walt died, and those left behind had to try and emulate his unique leadership. 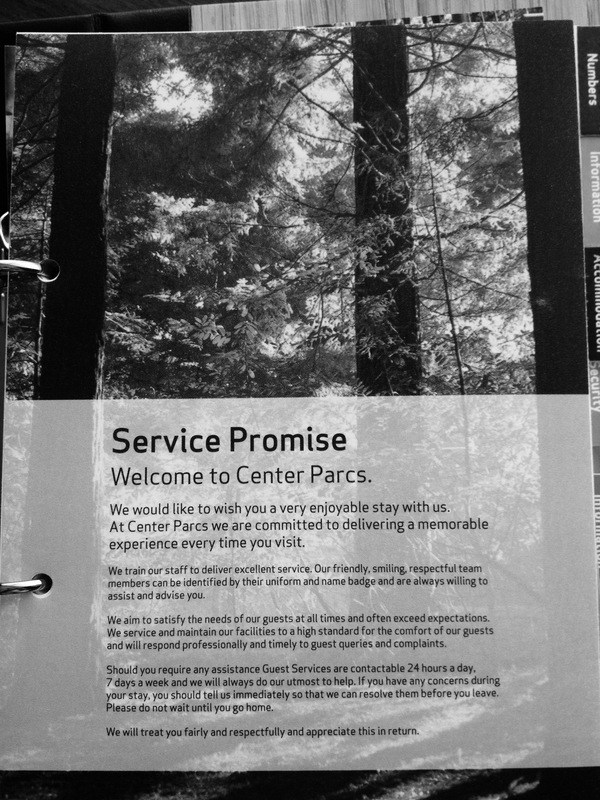 Walt’s Service Promise – ‘make people happy’ – is and remains as simple and compelling as Center Parcs’ current one (see photo) is lengthy and corporate. This is not to decry the obviously successful business model operated by Center Parcs. Rather, it is to draw a distinction between those businesses whose founding vision (their Purpose) is in their DNA, driving everything they do, and those who adopt a more prosaic, shareholder value-driven approach. So am I now a Center Parcs groupie, a card-carrying member of the ‘cult’? Suffice it to say that one of the key enhancements I believe they could bring to their Guest Experience would be a simple question: “Have you visited Center Parcs before?” And, what would make this small innovation really fly would be a concierge service (virtual and/or actual), streamlining the itinerary planning and activity booking process, as it isn’t actually as simple as it could be, at least to the uninitiated. That said, I had a very active weekend, much of it outdoors, and spent a lot of money. Piet would (I trust) have been proud.